With just 5 ingredients, these grilled potatoes in foil packets have everything going for them… Quick, easy, delicious, and virtually mess-free! This is a sponsored conversation on behalf of Tin Star Foods; all opinions and text are my own. Thank you for supporting the brands that support this site! Okay, so maybe that’s a BIT extreme and outside of our norm, but we do grill out A LOT. Typically my husband does the grilling, while I prepare a couple of sides on the stovetop or in the oven. But we’ve been experimenting with making more sides on the grill (oh, hi there yummy bacon-wrapped corn! 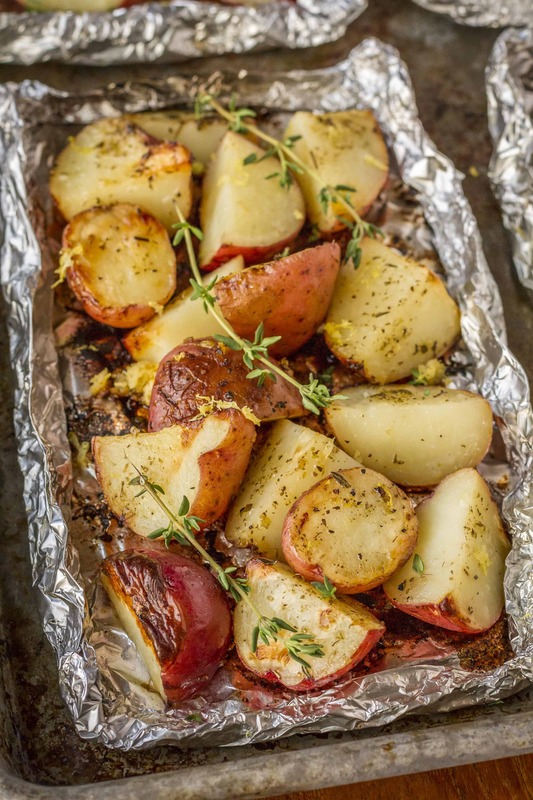 ), with these easy grilled potatoes in foil packets being one recipe that we’ve been turning to over and over. Grilling in foil packets is a surefire way to cook a simple and delicious side dish right alongside your protein without a lot of fuss. Plus it’s an excellent way to avoid cross-contamination if you have any vegetarians in your family. AND perhaps my favorite benefit, there’s virtually NO MESS! Serve these potatoes right in the foil, and then toss it after dinner. 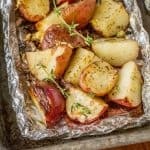 I developed this grilled potatoes in foil recipe back when we were in the midst of our Whole30 challenge, so it’s Whole30 compliant! This particular recipe uses ghee (a class of clarified butter that originated in India), which gives the potatoes a delicious delicate buttery flavor. If you’ve never tried it, you’re in for SUCH a treat — I fell madly in love during our Whole30 and haven’t looked back, and I think you will, too. I should warn you, though, not all ghee is the same. I’ve tried a few brands that are super high quality and amazing, but I’ve also tried a few that were absolutely awful. One was so bad that I threw the entire giant tub away… So, I’ll save you some of the hassle and just tell you to try one of the varieties from Tin Star Foods. They’re always high quality, delicious, and filled with essential vitamins and minerals. 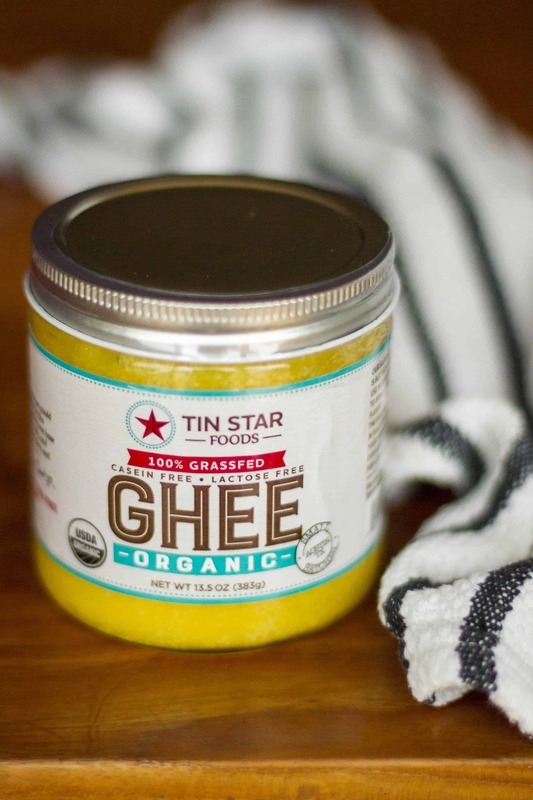 Made in small batches, with butter and cream from cows that were 100% grass fed, and using traditional cooking methods, you can truly taste the difference in Tin Star Foods ghee. 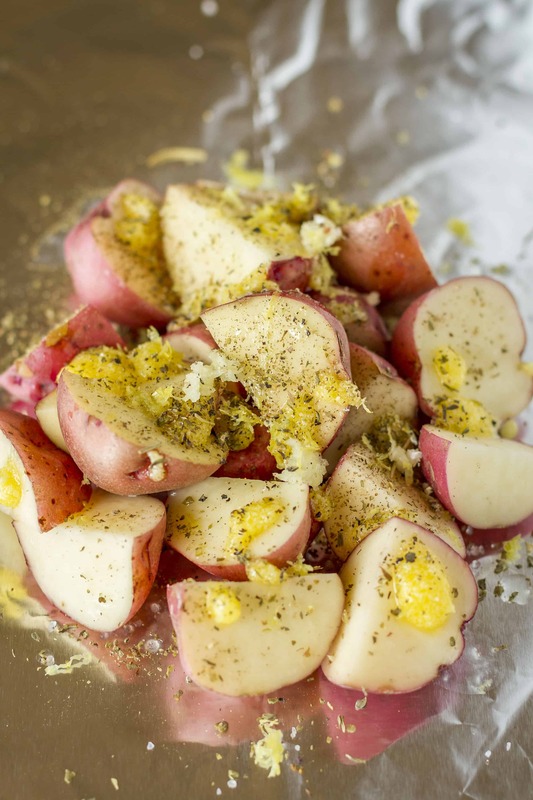 Five ingredients are all you need to make this amazing grilled potatoes in foil recipe — baby red potatoes, ghee, minced garlic, my favorite Italian seasoning, and the juice and zest of one lemon. Of course, you’ll also want to season them with a little salt and pepper, but I don’t include those in my ingredient count, because every home cook should have them on hand at all times. I like to divide the recipe among four foil packets, so I end up with four individual servings. If I need more than four servings, no problem! I’ve written the recipe so that it’s super easy to calculate how to increase the number of packets. Plus you can use this recipe as kind of a template to come up with your own flavor profiles. Try using different spices, adding some diced onions, crumbled bacon, shredded cheese, etc. — there are SO many possibilities! 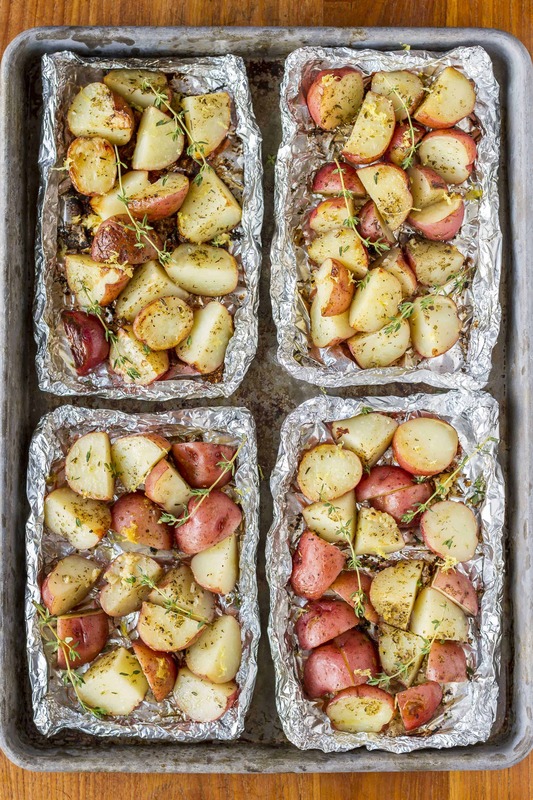 These grilled potatoes in foil packets have everything going for them… Quick, easy, delicious, and virtually mess-free! Cut four pieces of aluminum foil into 14-inch lengths. Place 1/2 pound of the quartered baby red potatoes in the center of each packet. Drizzle each packet with 2 teaspoons of ghee. Sprinkle 1/4 teaspoon of minced garlic and 1/4 teaspoon of Italian seasoning over top of each. Add 1/2 tablespoon lemon juice and equal parts of lemon zest to each. Season with salt and pepper to taste. Pull the foil edges together and scrunch them up to seal each packet. To grill these packets: Preheat the grill to medium heat and place the packets directly on the grill. Close the grill cover and cook for 30-35 minutes until tender, turning the packets frequently. To bake these packets: Place side by side on a baking sheet and bake in an oven preheated to 400 degrees until the potatoes are tender, about 15 – 20 minutes. Carefully unwrap each packet before serving. Season with additional salt and pepper to taste. Want to learn how to make zucchini pasta with just 3 ingredients? Start with a bag of frozen zucchini noodles, and you can have this easy zucchini noodles recipe on your table in under 10 minutes! Low carb, gluten-free & Whole30 compliant. These sauteed green beans with garlic are a simple and easy side dish… Adding a little extra raw minced garlic at the end of cooking gives them an extra unexpected punch of flavor! Are you ready to give ghee a try? I’ve got a great coupon code that will help you save on your first purchase. Right now, you can save 10% off Tin Star Foods organic ghee, ghee, and brown butter ghee with the code YUMMGHEE exclusively on Amazon.com. Order some now — the coupon expires on 7/31/17! grilled potatoes are my favorite!